Presented at the 46th AIAA Aerospace Sciences Meeting and Exhibit in Reno, 2008 January 7-10. 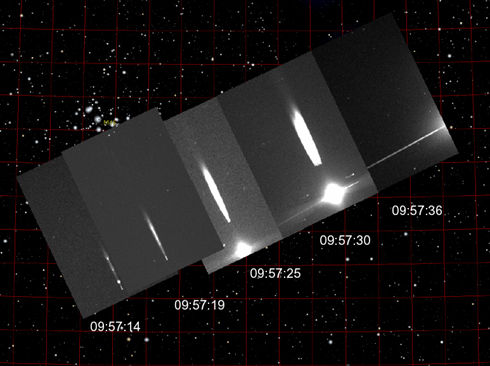 The Stardust SRC Entry observing campaign was a big success, with data gathered from all key emission signatures. The data analysis and interpretation took longer because of the quality and importance of the results in hand. The Stardust SRC entry is now understood as a field test of the heat shield material to be used on NASA's new generation of return vehicles, the CEV. First results were presented at the 46th AIAA Aerospace Sciences Meeting and Exhibit in Reno, in a special session "Stardust Aerosciences" on January 7, 2008. The following papers were presented (overview paper of the post-flight analysis: "Post-flight analysis of the Stardust Sample Return Capsule Earth Entry" by D. Kontinos, and M. Stackpoole, AIAA-2008-1197). This summary is by Peter Jenniskens. The Stardust SRC entry trajectory was reconstructed by Prasun Desai, based on the final information about the approach path and data on recovery of the capsule when the parachute had deployed. This trajectory was subsequently compared to that derived from the ground-based photographs and the airborne video data in hand. The star background in the night-time observations was used as an accurate reference frame for astrometry. Creon Levit and colleagues showed that the measured entry trajectory agreed to that calculated within error for most of the entry path. "Post-flight aerothermal analysis of the Stardust Sample Return Capsule" (K. Trumble, I. Cozmula, S. Sepka, P. Jenniskens, AIAA-2008-1201). 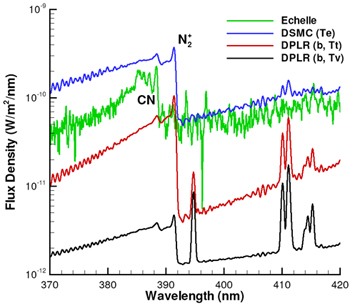 Peter Jenniskens described the calibration of his high spectral resolution Echelle data, which contain both well resolved emission lines and a broad blackbody background emission. Kerry Trumble et al. showed how an accurate fit to the data could be obtained if ablation was taken into account (red lines). Early in flight, ablation of a white paint layer (which was not modeled) caused an additional lag in the increase of surface temperature. The result of temperature measurements is most sensitive to the absolute flux calibration. 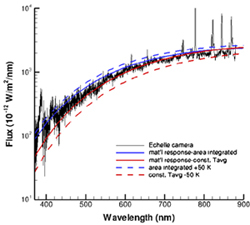 Other datasets, such as the cooled CCD images by Franziska Harms et al., provided an independent calibration of the Echelle data. This dataset was compared to the spectra of stars in the Pleiades cluster for an internal calibration of the data, with good agreement. The intensity of the nitrogen atom lines were well matched to model calculations of the shock emission, but the model by Yen Lui et al. did not correctly predict the oxygen line intensity. The model takes into account the orientation and distance of the capsule during the observations, which can not account for the discrepancy. The N2+ band was also detected in the Echelle data and matched by certain flow models, but not by others, as demonstrated in the work by Iain Boyd et al. The predicted N2+ band intensity varies by an order of magnitude in the different models, much more so than the predicted oxygen and nitrogen atomic line intensities. 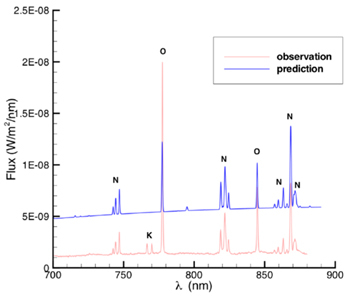 The N2+ band was also measured well in the SLIT spectra by Michael Winter et al., who studied both the intensity of the N2+ band and the iso-electric emission of CN. Winter had found that scattering of long-wavelength light inside the spectrometer had affected his earlier results (shown above), but now was able to correct for scattered light properly following laboratory calibrations using hot graybody sources. The CN emission is understood to originate from the carbon ablation off the PICA heat shield material. The heat shield ablation was likely also responsible for the presence of hydrogen atomic emission lines (H) in the observed spectra. Geoff McHarg and Hans Nielsen presented results from the High Framerate Imager. 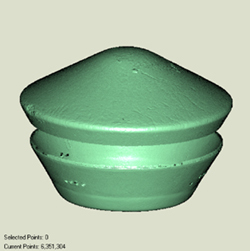 Early results show no periodic variation of the emission signatures due to spinning or tumbling of the capsule. 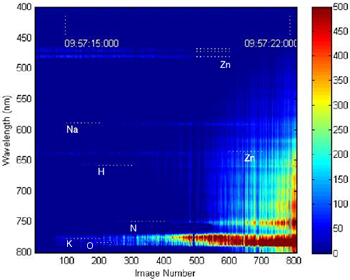 This data also showed the early release of the white paint layer in signals of zinc (Zn), sodium (Na), and potassium (K). Boyd et al. presented an analysis of the intensity of the zinc, sodium, and potassium lines, arguing that zinc and potassium had to originate in the paint layer. The paint layer was released early in flight, at relatively high altitude. Much interest existed among the modelers in trying to correctly calculate emissions at high altitude, where the regime for validity of DSMC and CFD models overlap. In addition, first results were presented on laser altimeter studies of the SRC heat shield surface to measure the total amount of PICA ablated from the heat shield. Analysis of core samples showed how the PICA was changed as a function of depth in the recovered heat shield. "Stardust - an artificial, low velocity "meteor" fall and recovery: 15 January 2006" (D. O. Revelle, W. N. Edwards, in Meteoritics and Planetary Science Volume 42, p. 271-299). In October 2006, the infrasound (accoustic) signal detected during the Stardust SRC entry at Wendowver, N.V., was analysed and results were published. Full paper.